Before the baseball season began, Pahrump Valley coach Brian Hayes thought one of his biggest problems would be player egos. K.M. 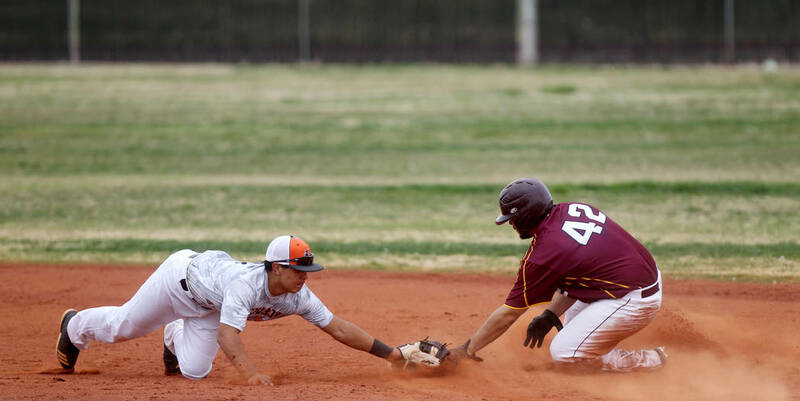 Cannon/Las Vegas Review-Journal Pahrump Valley's Bradda Costa slides safely into second base as Chaparral shortstop James Cobian fields the throw during the second inning of their baseball game March 21 at Chaparral High School in Las Vegas. K.M. Cannon/Las Vegas Review-Journal Nico Velazquez of Pahrump Valley is safe at second base during a March 21 game against Chaparral in Las Vegas. After all, he reasoned, many players on his roster were good enough to start on many teams but not on the talented Trojans. “We’re pretty much two deep everywhere,” he said at the time. With a chance to prove their coach right, the Trojans are struggling miserably. With eight players unable to participate until April 2 at Virgin Valley, plenty of others Hayes thought he could compete with have had chances to show what they can do. The result is a 3-9 record, with Pahrump Valley surrendering at least 10 runs five times. 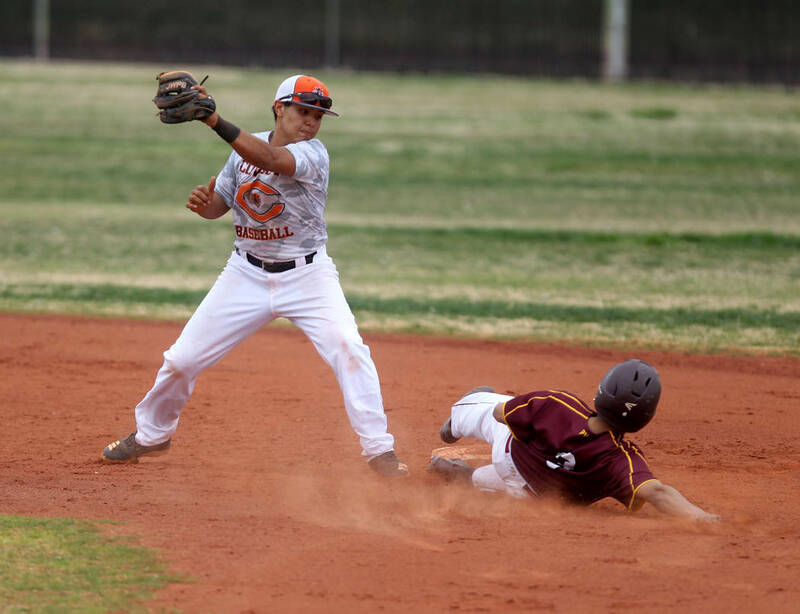 The latest debacle came Monday during the Grizzly Invitational at Spring Valley High School in Las Vegas, where the Trojans suffered two mercy-rule defeats. First, it was Boulder City, a potential postseason opponent. The Trojans led 2-0 early before a four-run inning helped by two errors turned the tide. But the Eagles didn’t start hitting the ball hard until the fifth, when three doubles fueled a five-run inning that pushed the game to the brink of an early conclusion. An RBI single in the sixth put an end to it, with Boulder City walking off with a 12-2 win. Despite the score, one of the bright spots for Hayes was the starting pitcher. Freshman Jake Riding, making his first varsity start, pitched into the fifth, trying to eat innings for an undermanned staff. The second game of the day figured to be tougher, and it was. The Grizzlies, a Class 4A team that came into the day with a 6-4 record, scored early and often. Mitchell Otis and Kade Higgins led off the game with back-to-back home runs, Otis’ was of the inside-the-park variety while Higgins cleared the right-field fence, as Spring Valley put up five runs before an out was recorded. The seven-run first inning essentially decided the issue, but not before some horrific moments for the Trojans. A two-out, three-run Spring Valley in the third featured just one hit. Higgins walked to get on base, then went to second, third and home on wild pitches. The eight-run fourth that ended the 18-3 contest featured three walks, two errors, two more wild pitches and two visits to the mound by Hayes. Oddly, a bright spot was two-out hitting, as all three runs came on two-out RBI singles by Cole Walker and Bradda Costa in the second and Brendan Ormiston in the fourth. But Hayes has been left wondering if the players who are out there believe they can get the job done. “I personally think as a coach that we can compete with the group that we have, but I don’t know if they think that,” Hayes said. “We played a decent game against Tech; we lost in extra innings. Then we played Chaparral and we were up 1-0 going into the fourth and just fell apart. Then we beat Durango in nine innings, and today against Boulder City we played a pretty good game for four innings and then just kind of imploded. Hayes is most disappointed in his defense. With pitching depth shredded by the absences, he knew his less-experienced hurlers would need to pitch to the defense, and it simply has not worked out. “Can they focus on baseball?” Hayes mused. “We’re already in this predicament because guys weren’t focused on playing, and instead focused on doing what they wanted to do, and now we’ve got guys on the field and we don’t know if their focus level is where it needs to be. There is good news for the Trojans, and not just that the “other guys” return in a few days. Sunset League play has not yet begun, so none of the defeats counts in the league standings. And it is the league standings that will decide postseason berths. Last season, Pahrump Valley cruised to a 10-0 league record, outscoring opponents 107-24. The Trojans’ first Sunset League game is April 9 at home against Mojave, and they will have had a full week with their entire roster intact by then. So despite the poor start, Pahrump Valley has plenty to play for and, potentially, all of their preseason goals are still attainable. For now, Hayes probably does have ego problems on his roster, just not the kind he anticipated.